Sea Shepherd is a vigilante environmental organization founded by Paul Watson (the subject of an excellent New Yorker profile a few years back), that tries to prevent Japanese fleets from killing whales in Antarctic waters, by monitoring and ramming them. In order to avoid the Sea Shepherd’s boats, Watson says the fleets have started sending harpoon boats to follow his ships when they get close, to relay their coordinates and allow the whalers to escape. 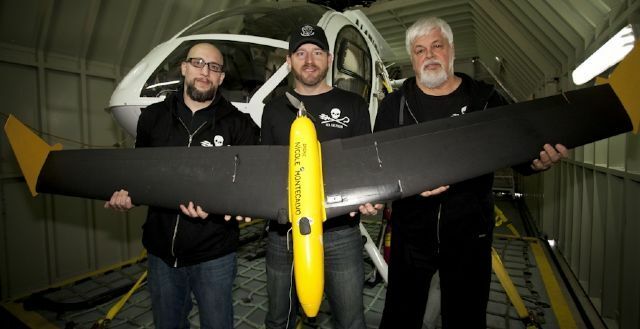 But Sea Shepherd gained an advantage in the catfish and mouse game this year by acquiring drones for two of its ships, the Steve Irwin and the Bob Barker. Osprey drones from Hangar 18 can fly approximately 200 miles from the ships, making it easier to find and keep on the tail of the whalers.